Exhibitors have a unique opportunity to gain access to many senior decision makers and buyers, such as emergency response agencies, Government departments and organisations from the UK and overseas. Access unique Government Zones – network with Government agencies, improve knowledge and stay ahead of the latest initiatives. Excellent source of quality leads – Only visitors pre-approved against Home Office criteria attend, giving you the opportunity to meet with those at the highest level of responsibility for operational decisions in law enforcement, security, civil protection and national resilience. 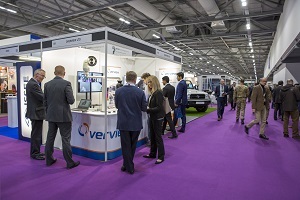 Platform to launch new products – At the 2018 event over 50 exhibitors chose Security & Policing as a platform to launch new products to this captive audience. Meet with key Government officials – Book yourself in to the official Department for International Trade Defence and Security Organisation (DIT DSO) delegation programme, head along to the exclusive exhibitor drinks reception to network with International Delegations or meet face to face with JSaRC teams and the DIT DSO country desk officers.